Duolingo Review with LTL Mandarin School - How Duolingo rate? In our never ending quest for the best Chinese learning apps our journey takes us to Duolingo. One of the biggest names around in language learning. With most of our other apps we’ve reviewed, they specifically teach Chinese. Duolingo on the other hand has a huge range of languages to use so we delve into the Chinese version and see if it’s worth the download or not. So what’s Duolingo all about? Duolingo’s user interface and design is simple and effective. The app contains a list of topics which progressively get harder. Start at the top and work your down to the bottom when, hopefully, you’ll have made a vast improvement. A feature I immediately took to was the “assessment” that I undertook when first playing with the app. I downloaded the app with a basic-intermediate level of Chinese so I didn’t want to go back to the start and waste time on the simple stuff. However, with the long list of “lessons” I’d have had no idea where to start. The “assessment” placed me at a level it thought fit and their choice was pretty accurate. The first few lessons were a little easy, but all good to review. Then, soon enough I came across a wealth of new characters and sentence structures without wasting too much time. A good feature in my eyes. The categories are split into the typical day to day things you’d go about or talk about. Things like your family, entertainment, going shopping. It’s all covered and each section gets progressively harder as you move forward. Lessons can last anything between 5 and 15 minutes roughly, depending on how you are getting to grips with the characters and structures. They are split with numerous different activities. Typically you’d start by learning 3 or 4 relevant characters with their respective pinyin and then you’d have to match 5 pairs of characters with the pinyin which I find quite fun. Once becoming familiar with the character you then move onto the sentences themselves. Here you are either given a sentence in English or Chinese. Your job then, is to create the sentence in the other language. It’s useful because it works both ways and not just one way. You get the chance to decode Chinese into English, but also create a sentence in Chinese after reading the English. When studying you must note your “health”. You get a set number of lives, if you run out (you lose health for each question you get wrong), you have to wait or use any spare “coins” you’ve built up to buy back full health. Health, don’t punish learners – I see what Duolingo are doing with health but I can’t help but feel it punishes people for getting things wrong. It almost installs a fear of failure. No one should have that when learning a language. You are supposed to make mistakes, you are told to make mistakes, then learn from them. If I lose my final bit of health I have to close the app and wait a few hours. By then I’ve forgotten where or why I went wrong. Language learners shouldn’t be punished. Explain the new characters – When I learn a new character, it’s a great feeling! Another one ticked off! However, Duolingo doesn’t actually tell us what the new character means. We get the pinyin and the character, but before we actually know the meaning we are given a sentence. I think the idea is to make you give an “educated guess” when the sentences arrive. However, I believe the learning experience would increase if we just had the definition of each character explained. 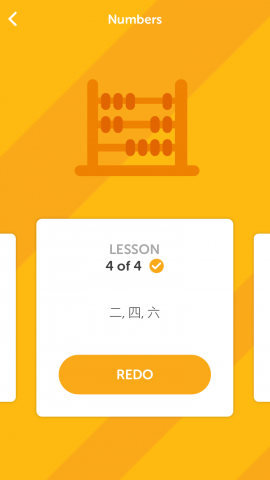 Duolingo – What’s great about this app for learning Chinese? 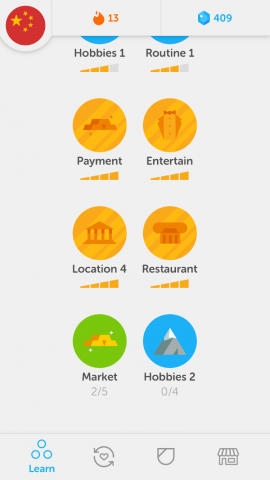 Simple interface – Getting around Duolingo is very easy. The look and feel of the app is fresh, the navigation is convenient and it effectively uses the “less is more” elements of design. Sentence structure – An important part of learning Chinese. Many apps teach vocabulary but not sentence building. The app drills home various structures until you become absolutely happy with how to build various sentences. Weakest words – This is a smart feature that allows you to target the words you perform less well with. The way to success with any language is practice, so to target the words you struggle with more is a great idea and one I find effective. Sometimes I feel the weaker words aren’t wholly accurate but in general it picks up well where I might perform less well. Variety of Topics – From Shopping to Sports, Time to Transport, it’s all covered. Duolingo covers pretty much everything you need to in day to day life in China. I also particularly like the look of the Net Slang section (I haven’t quite reached it yet). This is a very clever addition in my opinion, in the day and age of social media and platforms to share content. Net slang is rife so to be able to learn these is a shrewd move. 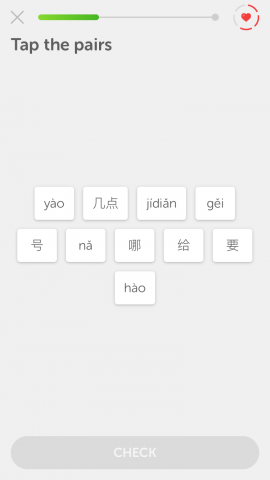 Is it possible to learn Chinese solely through Duolingo? In some instances I think that could very much be a resounding yes, but ultimately it depends on your end goal. The speaking side of Duolingo is a little more unnatural, the voices are a little robotic and not native speaking. Character recognition, words and sentence structure on the other hand are very well covered. I think it’ll give you a good basis but getting out there and speaking is something that you cannot avoid. However, one of my favourite parts of Duolingo is their motivational techniques. They really press home the “streak” (how many days can you study in a row) and it’s really working for me. Normally I study early in the day but if I’ve a busy morning and no chance to study Duolingo will drop me a little notification, nothing too intrusive, just to nudge me to get my days work in. Likewise they’d also drop an email congratulating you on your progress and willing you on further. Although it’s clearly automated and mass produced it really still held a personal feel to it. I’d be confident in saying without the emails and notifications my current two month long streak would not be the same. Tell us the meaning of the character – For beginners this applies moreso. With my level of Chinese I can second guess many of the characters after knowing the pinyin but for a beginner to be faced with a character, and then be thrown straight into a translation question is a little unreasonable. How will the user know what the new character means? Don’t punish us – I see the idea with the Health bars as mentioned above but learners shouldn’t be punished. Simple as that. More focus on Tones – Again, for me this hasn’t been an issue but for beginners it will be. Tones are absolutely essential when learning Chinese and are the first thing the LTL teachers will teach you. Duolingo avoids teaching this. Some early exercises on recognising tones would go a long way to helping Chinese users when using Duolingo. Unnatural voices – As mentioned above, when sentences or words with more than one character are read, everything sounds a little like Microsoft Sam. Some native speakers and sentences that actually flow would be nice. 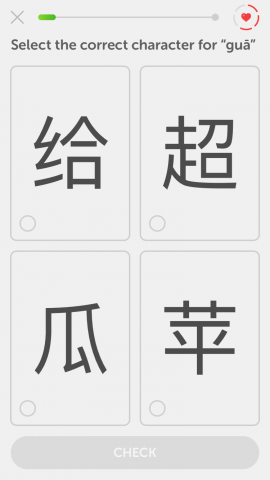 Duolingo for Chinese – Yay or Nay? Duolingo themselves actually introduced me to another project of theirs. Everyone has their own learning methods and flashcards are a popular one. They are visual, they improve your ability to memorize things, and they are actually quite fun as they are usable pretty much anywhere. Tinycards is another app based solely on the usage of flashcards. 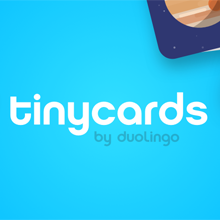 The great thing about Tinycards is pretty much any topic you can think of is covered, languages or not. I decided, being a resident in Beijing, that I wanted to become more familiar with Chinese geography, the provinces and their capitals. Low and behold there were a set of Tinycards for each of these. Within a pretty short space of time I understood where every province on the map was placed, and their capital. Tinycards uses repetition to drill home the knowledge firmly into your head and its effective. I’d recommend going back over the same set of cards maybe a few days or a week later to keep it refreshed. If studying a large number of flash cards it’d be easy to forget some. Reviewing them is essential in my opinion. The idea and execution of the app is excellent and I’ve no bad words to say about it thus far. It’s a quick and easy way to get familiar with a topic of your choice.